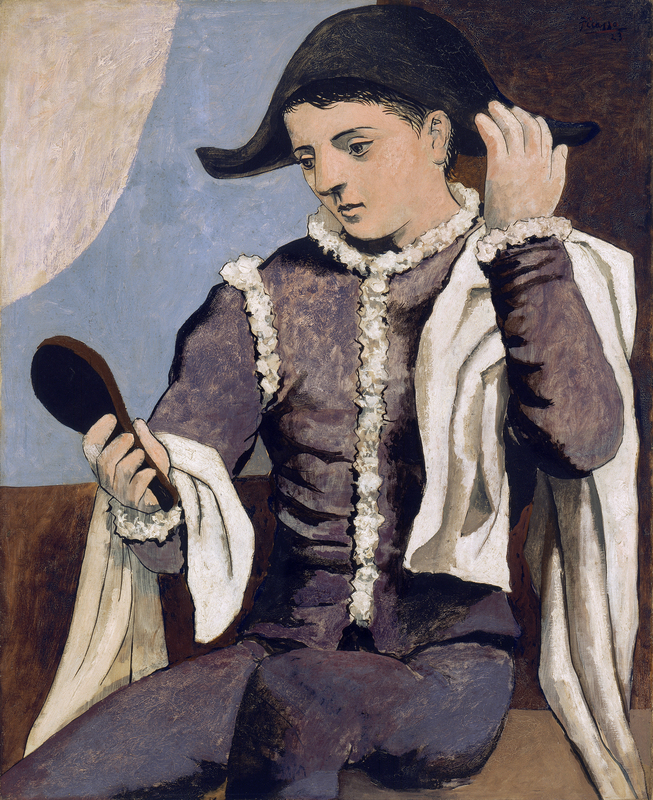 Initially intended as a self-portrait, Harlequin with a Mirror combines three characters from the circus and the Commedia dell’arte that held a strong fascination for Picasso, and with which he identified: the two-cornered hat is a clear reference to Harlequin, the clothes are those of an acrobat, while Pierrot’s face, turned into a mask, conceals the artist’s identity. The solid figure of Harlequin, whose body takes up most of the composition, is evidence of a new artistic idiom inspired by the classical approach of the great masters, which Picasso had adopted after his visit to Italy in 1917. Although his experience in Italy prompted a return to classical principles, he eschewed literal interpretation in favour of the free approach acquired through his previous Cubist experience. Europe’s interwar art scene was dominated by a return to classical ideas. From the mistrust of the values that had hitherto governed Western art emerged a new realistic approach to the world which aroused an anti-romantic reaction and fierce hostility towards the formalism of the avant-gardes. The widespread “return to order” awakened a keenly critical spirit and a pressing need to return to the real object and to reinstate the mimetic standards and durability of classical painting — albeit without forsaking modern artistic themes. This return to the past sprang from the avant-garde itself with the firm intention of re-establishing lasting values following the chaos and destruction inflicted by war. Picasso’s trip to Italy with Cocteau in 1917 marked the start of a new artistic language inspired by the classical tradition of Pompeian paintings and those of Raphael, Michelangelo and Ingres. However, Picasso’s classicism is deceptive: he uses Antiquity (in the same way that he had previously used African masks) to reinterpret traditional models without shunning the Cubist experience. Cubism had provided him with the key to handling the various elements of a picture differently and enabled him to tamper with the laws of perspective and combine various viewpoints in the same work. Harlequin with a Mirror is representative of this period and was defined by Douglas Cooper as resembling an image out of Pompeii. In the past it was generally associated with a set of seated harlequins painted by the artist during the early months of 1923, for which the Spanish painter Jacinto Salvadó posed in a costume Cocteau had given Picasso. However, a careful study of this group of works shows that the Harlequin in the Museo Thyssen-Bornemisza differs considerably from the rest. It is not even a proper harlequin but rather combines the presence of three characters from the world of the circus and the commedia dell’arte which Picasso found so appealing: the acrobat’s attire transports us to the world of saltimbanques and circus performers; the triangular hat is a clear reference to Harlequin; and the mask into which Picasso converts his face is Pierrot, Colombine’s spurned suitor who wallows in his melancholy, gazing at his image in the mirror, an attribute of deception and vanitas. As Tomàs Llorens recently revealed, Picasso initially approached the present painting as a self-portrait, since, as X-radiography shows, “the face that was initially a self-portrait of the painter takes on the impersonality of the mask in the final appearance of the work.” It should not be forgotten that in many aspects Picasso regarded Harlequin’s temperament as similar to his own, and throughout his life he portrayed himself in this guise on many occasions, generally for some sentimental reason. Some authors such as William Rubin and Pierre Daix have precisely associated Harlequin with a Mirror with an ambitious work from Picasso’s classical period entitled The Pipes of Pan and with Picasso’s frustrated love affair with the American Sara Murphy in Cap d’Antibes during the summer of 1923. The numerous preparatory drawings for this painting generally feature four figures: a couple formed by a young man and woman; Cupid (or Love) crowning the girl (depicted as Venus) with a garland of flowers; and Pan playing the music of love on his pipes. According to the aforementioned authors, the young Cupid (Picasso) who holds out the mirror to Venus (Sara) and who is disguised as the acrobat in some of the versions is portrayed alone and transformed into the Harlequin in the Museo Thyssen-Bornemisza. Harlequin with a Mirror and The Pipes of Pan were the crowning achievements of Picasso’s classicist period, but also brought it to a close. In the autumn of 1923 the artist concentrated on a series of still lifes executed in a style that has been described as “curvilinear” Cubism, which gradually evolved into his Surrealist period.